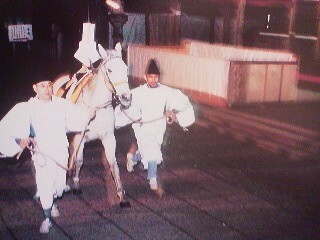 Japan is a repository of ancient Chinese customs, many which have died out in their country of origin long, long ago. Though it started back even earlier, it was especially in Japan`s Nara (710-794) and early Heian (794-1185) Periods, that Japan`s aristocracy tried to emulate almost anything and everything they could learn about the China of the Sui (481-618) and Tang (618-907) Dynasties. Then, even when certain of these customs and rituals faded away and came to be completely forgotten in China itself, as dynasties and times changed (especially with the Mongol conquests), some have remained alive and well here in Japan. It was just last week on New Year`s Day that people all over Japan celebrated the beginning of a new year by drinking O-TOSO (お屠蘇)- rice wine steeped with a special blend of herbs. As I have told you before in a previous post, this custom originated in Tang China ( the unique mixture of ingredients was based on a recipe devised by the ancient Chinese Physican (of the Three Kingdom Period) Hua Tuo. It was introduced to Japan during the Heian Period and is still a popular New Year`s custom today-more popular than it ever has been perhaps- while this custom completely died out in China centuries ago. Well, it is also on the 7th day of the new year, that two more long lost Chinese customs are practiced in Japan. One is quite popular- the eating of porridge filled with 7 specific vegetables called NANAGUSA GAYU and I have written about it in a previous post. The other is much, much, more obscure, but alas it DOES live on at at least two place in Japan- and one of them happens to be the Kashima Jingu Grand Shrine (about a 75 minute drive from Tsukuba). But in this year- The Year of the Horse – it should be getting much more attention that usual. The custom I am referring to is that of viewing a BLUE HORSE on the 7th day of the year. 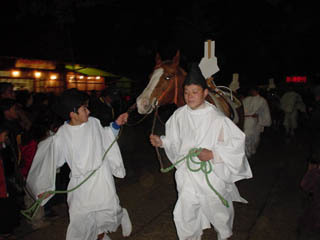 The event is called the AO UMA NO SECHI E (白馬の節会)- the ceremony of the BLUE HORSE ( though the character used actually mean WHITE HORSE !?) and it was long practiced at Japan`s imperial Palace in front of the Emperor and his circle. Of course there are no horses which are really blue, but the animals selected are a certain shade of white which is deemed blue. Why blue and why a horse? Well for that we have to refer to Chinese Ying Yang theory- blue represents spring, and horses represent of powerful YANG (positive, masculine, active) force. Viewing such an animal during a proper ceremony on that particular day, which was considered an important change-point in the year (sekku,節句) was believed to excorcize bad energies and extend ones life-span! It is said that those who come today to see the the BLUE HORSE- the color of wild duck feathers – will live forever! The ceremony is mentioned in the Ruiju Kokushi ( 類聚国史), a book of historical records which was completed in the year 892 after having been compiled by the great scholar and poet Sugawara no Michizane. According to this text the custom was first practiced in Japan during the reign of the Emperor Keiko. That would mean back in the 1st century of the common era-and this should definitely be taken with a grain of salt. From Yakamochi`s poem, however, it can be said with certainty that the practice of gazing at the BLUE HORSE began at least as far back as the 8th century. During the Heian Period after the capital had been moved to what is now Kyoto, the AO UMA NO SECHI E was held each year on the 7th day of the new year at the SHISHINDEN (紫宸殿) ceremonial hall at the old Imperial Palace. Offering were made of ritual bows and arrows. Gifts were distributed. 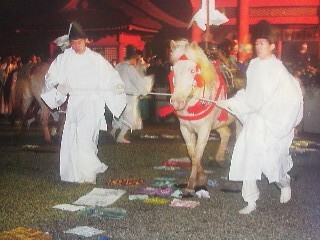 The horses were led in procession by the stablemasters. Dances were performed. This practice continued at the palace until the early Meiji Period (which began in 1868). But the custom did not die out completely. 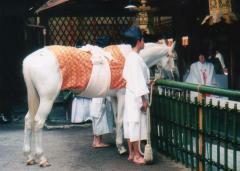 Over the centuries several important shrines around Japan adopted the ritual. The Kamo Betsurai Jinja in Kyoto, Sumiyoshi Jinja in Osaka, Munakata Jinja in Fukuoka Prefecture, and at the Kashima Jingu Grand Shrine right here in Ibaraki Prefecture (after having been introduced there as the OUME SAI by Fujiwara no Yoritsune more than 800 years ago. I have been able to confirm that the ritual still takes place at at least two of those shrines- the Kamo Jinja in Kyoto and at Kashima Jingu. At 6 pm, the ritual got underway. Non-alcoholic AMAZAKE and NANAGUSA GAYU PORRIDGE were distributed to the crowd. The horses- nine of them (of various color!) were brought out. The priests performed ablutions and chanted prayers. 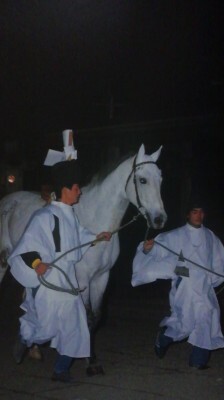 In the darkness, the white horses did seem almost blue ! 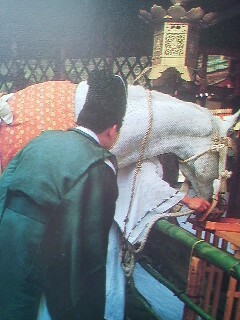 Probably the most memorable feature of the event was how worshippers lay handkerchieves or scarves on the path hoping that the Sacred Horses would step on them as they walked by. This is believed to be especially auspicious!